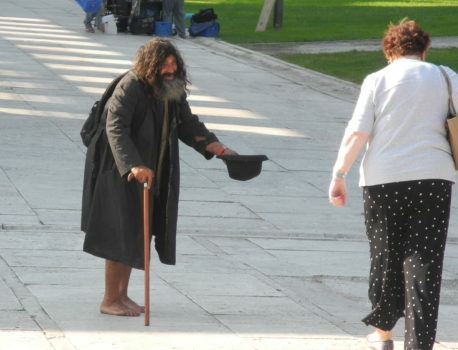 This is who I am - begging is one of the most primitive forms of fundraising - Coreniche Consulting Inc.
Begging is one of the most primitive forms of fundraising. This is what this man does for a living to survive. He is a productive worker. It takes a brave and desperate person to ask for money this way. There are few skills needed and unfortunately, it brings in small change. In my work as a fundraising consultant, I have witnessed many nonprofit staff and volunteers shortchanging the work of their charities by focussing on fundraising activities that attract small change. Begging has no place in charitable fundraising if real results are to be realized. Charities have a greater purpose beyond serving individual: they have causes benefitting a diverse group of people. The case of the solitary beggar in this image is a symptom of a bigger issue – that of the thousands of homelessness people who need help. Offering dignity and a transformed life to people living in this situation can only happen with larger gifts. There are many ways you can improve your fundraising to get out of the perpetual “begging” small change rut. Here are 8 of my favourite ways. Feel free to offer your suggestions as well. 1. Reduce reliance on special events and raffles that barely have break-even returns. They consume time and energy that could be directed at obtaining larger gifts. 2. Never ever put anyone on the spot by asking for a gift until they are ready to be asked – you will inevitably leave money on the table. 3. Have a clear, preconceived plan and longer range strategy that will really change lives and take your work efforts to much greater heights. 4. Implement fundraising strategies that set you distinctly apart from other charities. Innovation is the key. 5. If you do not have an experienced fundraiser on board, make resources available for training (online/offline)to get them up to speed quickly. Also, hiring a consultant to mentor your staff and its board of directors on the best ways to fundraise for your organization can speed up training schedule dramatically. 6. Communicate with, cultivate and steward your most committed donors through a major gift program. 7. Develop a monthly giving program that will make it possible for people to give progressively larger funds from a modest monthly donation of funds. 8. Use a reputable fundraising software system (not excel workbooks) to manage your lists of donors and prospects.